Salt, as any aspiring kitchen scientist can tell you, is a flavor enhancer. It’s not the star of a dish; it’s a supporting player—unless it’s really, really, really good salt. Salt, as any aspiring kitchen scientist can tell you, is a flavor enhancer. It’s not the star of a dish; it’s a supporting player—unless it’s really, really, really good salt. This past Tuesday, chef Michael Stanton of The Heathman Restaurant & Bar in Portland, Oregon, and selmelier Mark Bitterman of The Meadow (a specialty salt shop with locations in New York City and Portland) teamed up to create a dinner at the James Beard House in which weird and wonderful salts were the main event. There were salt block-cured sturgeon, salt-crusted morels and even a dessert of chocolate-covered pear dipped in three different salts. Infused with Tahitian vanilla pods, this flaky salt has the texture of phyllo dough. Its delicate flavor and subtle crunch make it a great finishing salt for mild, sweet seafood like crab or scallops. 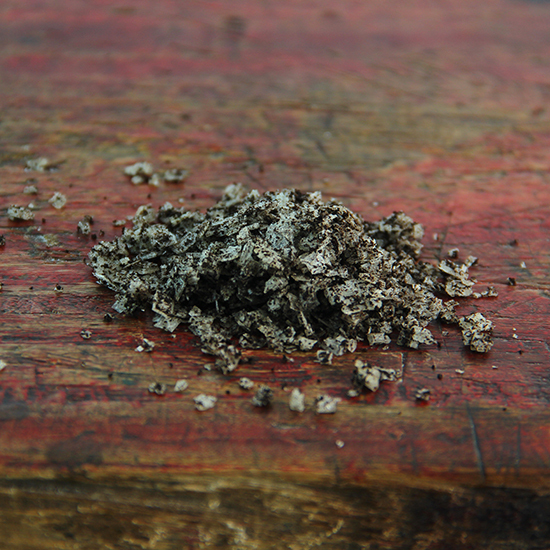 Dark gray and crumbly, this flinty, oyster-esque salt is poured into bamboo capsules and incinerated in a kiln. The carbonized salt has an amazing superpower: It gives lean meats the illusion of fattiness. According to Bitterman, this intensely smoky salt “tastes like the Yukon.” The large, crackling flakes are a beautiful pale pink and great for game meats as well as rich dishes like creamy risotto. This granular salt taken from the Adriatic has a unique sweetness. Bitterman likens it to berries. Super-powdery and the color of a café au lait, this salt starts as a powder that’s scraped off drying seaweed. That powder is made into a brine, then boiled down until the salt crystals form. It’s packed with a ton of umami flavor.